Join an exciting dart league now! Celebrating *30* years of running outstanding Dart Leagues and consistently providing fun very near to your front door, Twin States Music Company is a TON 80! All styles, games and variations of the popular pastime of darts can be found in our multiple leagues running almost nightly in great locations nearby. 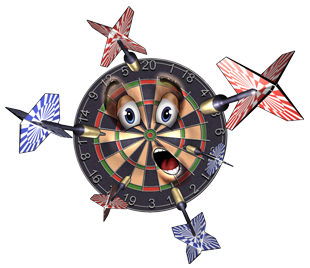 We sanction our dart players for both the Minnesota (MOMA) and Wisconsin (WAMO) State Tournaments. Along with that we also provide entries for Arachnid’s Bullshooter Tournaments and we also provide sanctioning for the NDA National Tournament each year hosted in awesome Vegas! Just ask our players that keep coming back year after year who play in Twin States Dart Leagues (now over 1000 players strong!) how exciting it is to compete at our very own year-end Regional Dart Tournament, that no other vendor can beat or match! Any skill level is welcome! Make it your “aim” to check in on the fun and not miss out on another year! For official dart rules, please visit the National Dart Association website. For Dart Sets & Supplies, please visit the Twin States Music Store website, now with FREE SHIPPING on all orders.